You'll explore the less-touristy side of things at Bitexco Financial Tower - Saigon Skydeck and Flymindz Art Studio. Do some cultural sightseeing at War Remnants Museum and Saigon Notre Dame Cathedral. There's still lots to do: make a trip to Cu Chi Tunnels, relax and rejuvenate at some of the top local wellness centers, contemplate in the serene atmosphere at Chùa Giác Lâm (Giac Lam Pagoda), and ponder the world of politics at The Independence Palace. For photos, reviews, other places to visit, and other tourist information, use the Ho Chi Minh City road trip planner. Manchester, UK to Ho Chi Minh City is an approximately 17-hour flight. You'll lose 7 hours traveling from Manchester to Ho Chi Minh City due to the time zone difference. Traveling from Manchester in December, expect Ho Chi Minh City to be warmer, temps between 36°C and 26°C. Cap off your sightseeing on the 4th (Tue) early enough to travel to Con Dao Islands. On the 5th (Wed), steep yourself in history at Con Dao Prison, then enjoy the sand and surf at Bãi Đầm Trầu, and then get engrossed in the history at Con Dao Museum. To see photos, traveler tips, more things to do, and more tourist information, refer to the Con Dao Islands vacation app . You can do a combination of flight and taxi from Ho Chi Minh City to Con Dao Islands in 2 hours. Other options are to do a combination of bus, car, and ferry; or do a combination of bus and ferry. Finish up your sightseeing early on the 5th (Wed) so you can travel to Phu Quoc Island. Get some cultural insight at Di Tích Nhà Tù Phú Quốc and Phu Quoc Gallery of Contemporary Art(GOCA). 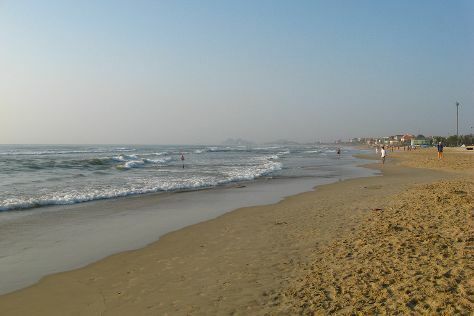 Step off the beaten path and head to Ong Lang Beach and Mui Ganh Dau Beach. The adventure continues: enjoy the sand and surf at Sao Beach, stroll through Long Beach, contemplate the waterfront views at Fingernail Island, and stop by The Green Boutique. To find maps and tourist information, go to the Phu Quoc Island trip planner . You can do a combination of taxi and flight from Con Dao Islands to Phu Quoc Island in 3.5 hours. Alternatively, you can do a combination of ferry and car. Wrap up your sightseeing on the 10th (Mon) to allow time to travel to Quy Nhon. Quy Nhơn is a coastal city in Bình Định Province in central Vietnam. Kick off your visit on the 11th (Tue): kick back and relax at Ky Co Beach, stroll through Bai Xep Beach, and then make a trip to Thap Doi (Twin Towers). For where to stay, ratings, photos, and other tourist information, use the Quy Nhon trip itinerary tool . You can fly from Phu Quoc Island to Quy Nhon in 4 hours. Alternatively, you can do a combination of flight and taxi; or do a combination of ferry, bus, and train. Wrap up your sightseeing on the 11th (Tue) to allow time to drive to Nha Trang. Long Son Pagoda and Po Nagar Cham Towers are good opportunities to explore the local culture. You'll get in some beach time at Long Beach and Hon Chong. Take a break from Nha Trang with a short trip to Bai Dai Beach in Cam Ranh, about 34 minutes away. Spend the 12th (Wed) among aquatic life with a scuba or snorkeling tour. And it doesn't end there: relax and rejuvenate at some of the top local wellness centers, witness a stunning natural landmark at i resort, take in the views from Xom Bong Bridge, and enjoy the sand and surf at Nha Trang Beach. To find traveler tips, ratings, maps, and other tourist information, read our Nha Trang trip itinerary app . Traveling by car from Quy Nhon to Nha Trang takes 3.5 hours. Alternatively, you can take a bus; or take a train. Cap off your sightseeing on the 16th (Sun) early enough to go by car to Phan Thiet. Kick off your visit on the 17th (Mon): take in the dramatic natural features at Red Sand Dunes, then enjoy the sand and surf at Hon Rom, then kick back and relax at Mui Ne Beach, and finally look for all kinds of wild species at Fairy Stream (Suoi Tien). On the 18th (Tue), you'll have a packed day of sightseeing: have some family-friendly fun at Trampoline Club Impulse, then head outdoors with Jibe's Beach Club, and then tour the pleasant surroundings at Bai Da Ong Dia Beach. To find maps, reviews, other places to visit, and other tourist information, you can read our Phan Thiet holiday maker app . Drive from Nha Trang to Phan Thiet in 3.5 hours. Alternatively, you can take a train; or take a bus. Wrap up your sightseeing on the 18th (Tue) early enough to travel to Hue. Eschew the tourist crowds and head to Tomb of Minh Mang and Thuan An Beach. 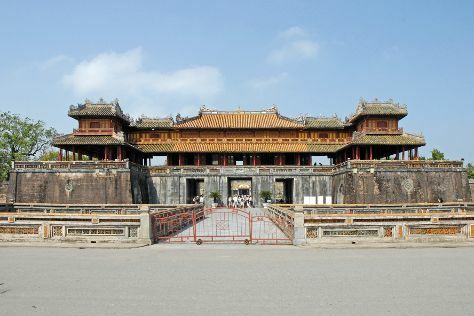 Get some cultural insight at Imperial City and Thien Mu Pagoda. There's lots more to do: steep yourself in history at Tomb of Tu Duc, get a dose of the wild on a nature and wildlife tour, don't miss a visit to The Noon Gate (Cua Ngo Mon), and look for all kinds of wild species at Dam Chuon Huong Quan. To see photos, reviews, ratings, and other tourist information, you can read our Hue trip itinerary planning app . Getting from Phan Thiet to Hue by combination of taxi and flight takes about 3.5 hours. Other options: do a combination of taxi, flight, and train; or drive. 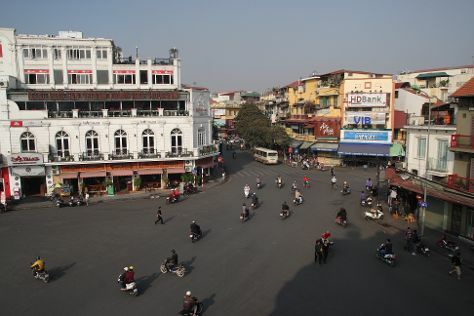 In December, daily temperatures in Hue can reach 26°C, while at night they dip to 21°C. Finish up your sightseeing early on the 22nd (Sat) so you can go by car to Hoi An. You'll enjoy a bit of beach vacationing at Non Nuoc Beach and My Khe Beach. Step off the beaten path and head to Tam Thanh Beach and Yaly Couture - Nguyen Duy Hieu branch. Change things up with these side-trips from Hoi An: Mỹ Sơn (in Duy Xuyen) and Da Nang Museum of Cham Sculpture (in Da Nang). Spend the 26th (Wed) on the water with a fishing tour. Next up on the itinerary: enjoy the sand and surf at Cua Dai Beach, make a trip to Hoi An Ancient Town, look for gifts at Villagecraft Planet Showroom & Boutique, and relax and rejuvenate at some of the top local wellness centers. To find photos, where to stay, traveler tips, and tourist information, read our Hoi An visit planner. Traveling by car from Hue to Hoi An takes 2 hours. Alternatively, you can do a combination of train and taxi; or take a bus. In December, daytime highs in Hoi An are 29°C, while nighttime lows are 23°C. Finish your sightseeing early on the 27th (Thu) to allow enough time to travel to Hanoi. Appreciate the collections at Vietnamese Women's Museum and 54 Traditions Gallery. Get some cultural insight at Old Quarter and Temple of Literature & National University. The adventure continues: steep yourself in history at Ho Chi Minh Mausoleum, explore the activities along West Lake, take an in-depth tour of Vietnam Museum of Ethnology, and admire the masterpieces at Ho Chi Minh Museum. For other places to visit, where to stay, and other tourist information, read Hanoi online trip maker . Do a combination of taxi and flight from Hoi An to Hanoi in 3.5 hours. Alternatively, you can do a combination of taxi, flight, and train; or drive. Wrap up your sightseeing by early afternoon on the 31st (Mon) to allow enough time to travel back home.